Police barricaded the front of the Indonesian Embassy in Makati City on Tuesday morning, just hours before the scheduled execution of Filipina Mary Jane Veloso in Indonesia. Veloso is to be executed for her part in a drug trafficking charge stemming from a recruitment agent who supposedly tricked her into transporting the drugs to her new job. A part of Salcedo Street which crosses at the Indonesian Embassy was also closed to traffic. Numerous demonstrators and others held vigils on that street. Veloso is to be executed by firing squad but a last-minute appeal may delay the execution after Veloso’s recruiter turned herself in just hours before. 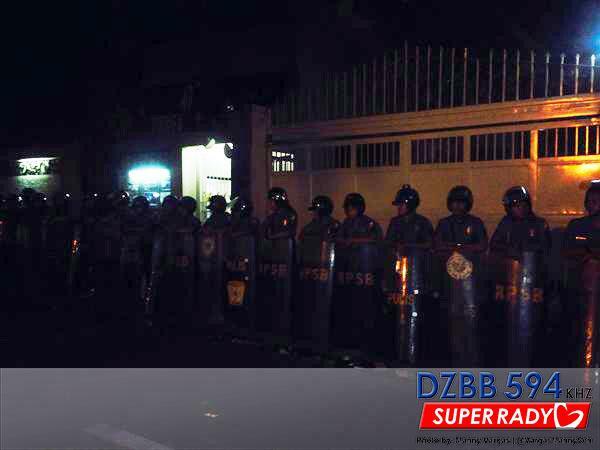 Police are standing by at the embassy in full riot gear for any official word coming in from Indonesia. ALSO READ: Opinion: Should the main export of the Philippines still be 'slaves'? Thank God the execution did not happen. One solution to stop human trafficking in the Philippines is to give the people decent jobs and salary. Filipinos find jobs abroad or even online because there’s not much opportunity here. There are not enough jobs in the Philippines that why people go abroad and in many cases fell victim to human trafficking and abuses.